There is something magical about spotting a giant, colourful, inflated balloon (or a flotilla of them) sailing through the skies over your town. I used to work on the edge of Melbourne’s Botanic Gardens and when I arrived early to work, my route from the train station to work would walk me past the MCG sport stadium and then across the muddy Yarra River. As I approached the river I would often see hot air balloons that had probably left Melbourne’s Yarra Valley at 5am drifting over the gardens or over the city. When I saw them, they would always lift my mood. What is it about a hot air balloon? I’ve never actually been in one, although I’d like to have the opportunity one day. To me, hot air balloons are mystical, they appear to me as if out of nowhere and hover high up defying gravity. I can never see the passengers in the baskets, so they appear only as a spot of colour. Whenever I see them I feel like pointing them out to someone, not content to keep my marvelling to myself. I have to admit to a penchant for the Regency fiction of Georgette Heyer. Some may pour scorn, but she wrote well and although the basic plots were Jane-Austen style Regency societal tales (with a central romance or two), Heyer infused them with gallons of historical detail about the period. In her novel Frederica, set in about 1818, at one point Felix, the brother of the heroine (Frederica) accidentally gets carried away in a hot air balloon that was on show at an exhibition by some balloon adventurers. The Lord of the moment, the Marquis of Alverstoke, who has a tendre for the heroine helps to track down the fly-away young brother as he travels cross-country on his unintended balloon excursion. Even today there remains that random factor about balloon travel that, although I’m sure they plan for a particular destination, sometimes weather or other factors intervene and they have to make an unintended set-down. But (as long as the set-down isn’t in a hazardous location) there is something charming to me about the lack of ultimate control in an age of hyper-scheduling and technological control. I’ve been told that even whether a balloon can take off in the morning in the first place is impacted on heavily by weather conditions. 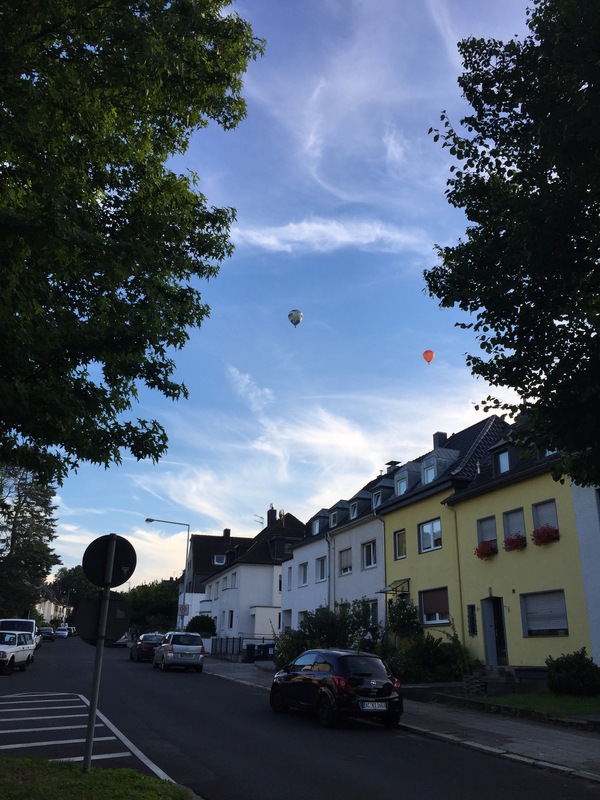 I’m staying in Germany at the moment and several days I have glimpsed balloons in the sky over Aachen. At first I was surprised to see them in the mid-late afternoon as I’d always seen them at home in the early morning. But regardless, when I saw them they appeared to me as symbols of hope. Something about them lifts the mind from daily concerns to the boundless possibilities of the skies. If I were asked to spend a year living elsewhere, I’d choose to live in Regency England. A thorough indoctrination as an adolescent in the Regency world of the novels of Jane Austen and Georgette Heyer has left me with a yearning to circulate at a gala affair in the Brighton Pavilion, where guests take pinches of snuff from dainty boxes, to take a turn about the Pump Room and taste the revivifying waters in Bath, or to spectate as young men race their curicles down the London road. There would definitely be no shortage of cultural experiences to be had from such a trip! I’m not sure how I’d fare, diet-wise, as a vegetarian, if faced with a pheasant dish or some equally meaty treat. I suspect the food would not be a highlight of my visit. A nice glass of claret to wash it all down might be the best I could hope for. If I was studying in Regency England, I would have to hope to be a young man, taught at home by a private tutor, and then able to go on to University. I don’t think I’d relish being a street urchin, an illiterate servant or even a woman, who may be tutored only in literature, languages and the ‘accomplishments proper for a young lady’, such as drawing and playing the pianoforte. I’ve always liked Regency women’s fashion – the empire line has a certain allure, and I do love a velvet pelisse or spencer jacket (à la the ones shown in BBC costume dramas). However some women at the time just about froze to death for the sake of fashion, in their thin muslin gowns, and the thought of life before the bra was invented is a bit hard to stomach. Luckily I can sew, although not particularly well, so I’d hope to be staying with a family who could afford their own dressmaker or I might have a severely limited wardrobe. You were always fortunate in those novels to have been left a handsome sum of money by a deceased relation. London or Bath I’d be happy to reside in, hopefully with not too many holidays to depressingly grey english seaside resorts like Lyme Regis, with their stony beaches and seaside promenades. Too much rainy weather would drive me batty, I’d certainly hope to be cooped up in a stately home, rather than a modest household establishment. Heyer’s heroines usually attended many balls and outings to the theatre, and these sound like part of an enjoyable social life. Where I grew up, debutante balls were not the fashion, so I’m not sure how I’d go if I had to be trained in order to ‘come out into society’ and it would be rather restrictive on my travels to have to go everywhere with a servant or relative in order to avoid being seen as ‘fast’ or as guilty of improper behaviour. Unfortunately I wouldn’t be able to capture my tourist photos with a digital camera, so I guess I’d have to keep an old school journal and sketchbook. And as I couldn’t email to back home while I was gone, it would be rather isolating when I needed to debrief my weird cultural experiences or faux pas and have a laugh with someone who understood my own culture. 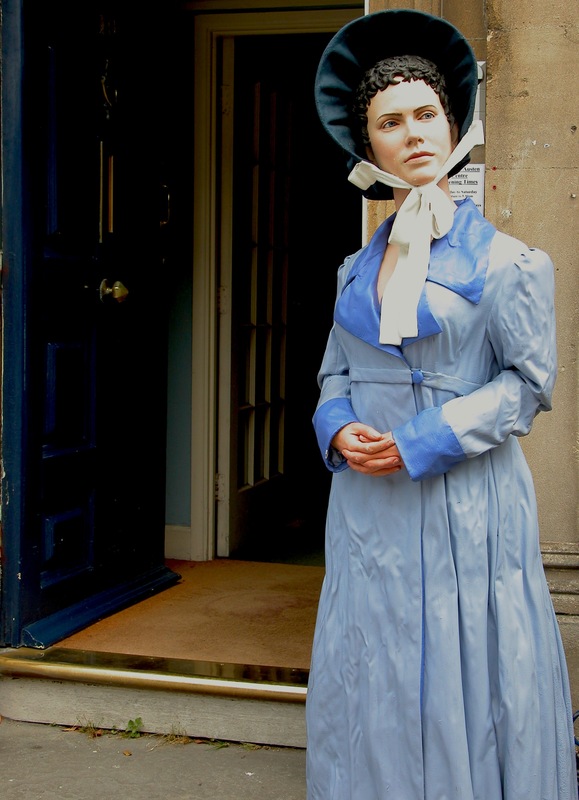 In order to seep myself in the way they used language at the time I’d have to have a back-to-back Austen-reading marathon before I left for my travels, so that I could sound just right and start my sentences with ‘Far be it from me, my dear friend…’.